The cis-splice-effects associate command is used to identify splicing misregulation events. This command is similar to cis-splice-effects identify, but takes the BED output of junctions extract in lieu of a BAM file with RNA alignments. The tool then proceeds to associate non-canonical splicing junctions near the variant sites. variants.vcf Variant call in VCF format from which to look for cis-splice-effects. junctions.bed BED file of junctions to look through for evidence of splice events. The file is expected to be in the BED12 format of the junctions extract output. ref.fa The reference FASTA file. The donor and acceptor sequences used in the "splice-site" column of the annotated junctions are extracted from the FASTA file. 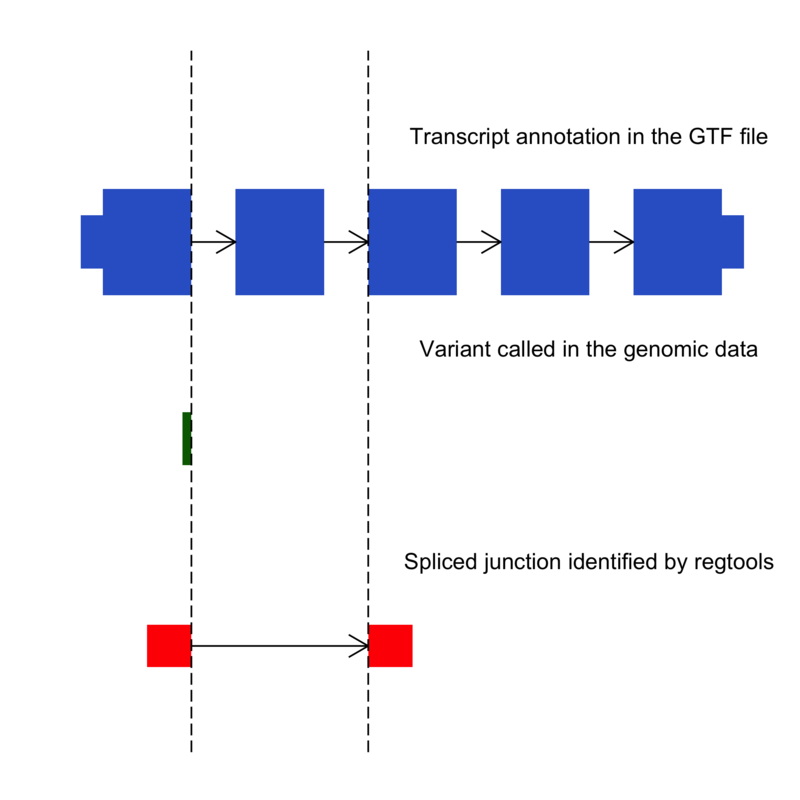 annotations.gtf The GTF file specifies the transcriptome that is used to annotate the junctions and variants. For examples, the Ensembl GTFs for release78 are here. Note - Please make sure that the version of the annotation GTF that you use corresponds with the version of the assembly build (ref.fa) and that the co-ordinates in the VCF file are also from the same build. -v STR Output file containing variants annotated as splice relevant (VCF format). -j STR Output file containing the aberrant junctions in BED12 format. -s INT Strand specificity of RNA library preparation, where 0 = unstranded/XS, 1 = first-strand/RF, 2 = second-strand/FR. This option is required. If your alignments contain XS tags, these will be used in the "unstranded" mode. -w INT Window size in b.p to associate splicing events in. The tool identifies events in variant.start +/- w basepairs. Default behaviour is to look at the window between previous and next exons. -I Annotate variants in intronic space within a transcript(not to be used with -i). -E Annotate variants in exonic space within a transcript(not to be used with -e). -S Don't skip single exon transcripts.